Subject is a mistranslation of, "Now this machine is under repairs." If you know the Japanese, it's pretty hilarious that they translated "Now" as "I'm Home." So last time I mentioned I hosted an event at my school. Let me go in to more detail and introduce to you the city of Kurashiki. Kurashiki sits upriver from the Seto inland sea. The sea is protected by islands and the land is peaceful so you'd expect a bustling port along the coast. However this flat land west of Okayama city was never ideal. Tides came up the coastal plain, making the land salty and unfit for crops. It wasn't until a sea wall was eventually built that thought was put in to what the land could be used for. Finally, the area was turned in to cotton fields, as cotton can handle a harsher soil than rice can. A cotton mill was established and storehouses were built around it. 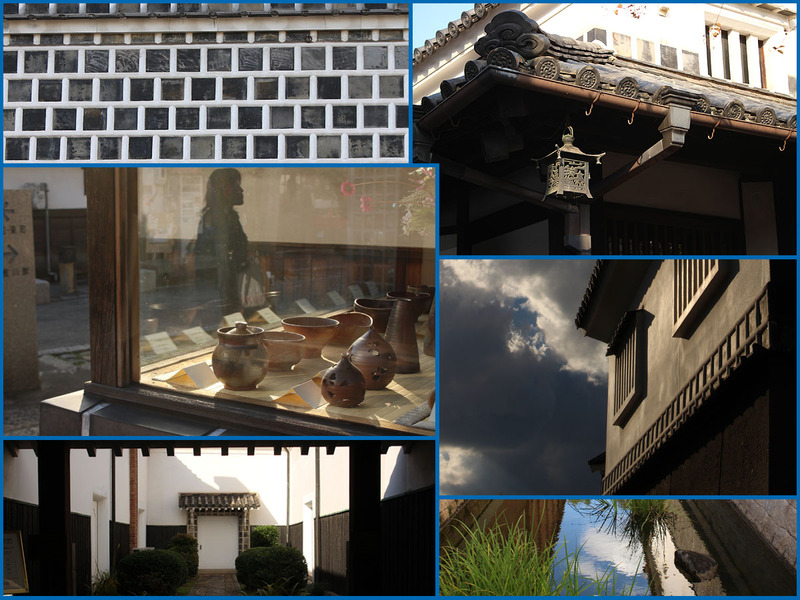 Kurashiki means "Storehouse village" and became a place for commerce where goods, mostly cotton and rice, could be stored. Well I was asked to take a group of students to Kurashiki and teach them how to speak English outside of the classroom in a realistic situation. The downside was that I wasn't allowed to spend any money. I was a bit nervous so I decided to do some research and take a trip down there myself. My research showed me that there was going to be a lot of traditional architecture to look at. I found a list of Japanese terms for architectural points that I would have to be able to identify and explain in English for the students, then teach them how to explain these terms for themselves. Horned-windows, bug-cage windows, molded roof tiles, plaster lattices, tiled walls, protective grating, cedar balls. . . It seemed a bit daunting actually. What if students asked me questions I couldn't answer? What if I mixed up my terms? Were these things even interesting? I asked a coworker to go with me for a preliminary look around, but unfortunately other obligations popped up at the last minute and I ended up alone. No matter. The first thing I did when I got there was hop in to a cafe and sit down next to some tourists. I told them I was doing this tour for my English class and asked them what they thought of the area. It was an older couple who were on a three week vacation in Japan. They said they'd gone to Japan before to see the major sightseeing places, and now were interested in more of the out-of-the-way areas. The man was a professional photographer who said he's never worked a day in his life - it's all play. He told me Kurashiki is so beautiful and it must be so relaxing and peaceful to live in such a wonderful country. That kind of amused me. Just behind us was the waitress who was busy making sure no customer was left waiting, and making sure everyone was able to sit somewhere comfortable despite the fact that it was a sit-where-you-like kind of place. Not only was she balancing orders, but she was bowing, greeting, getting people moving, all to meet the rigid standards of Japanese hospitality and the idea that if the customer waits more than a few seconds, one must apologize profusely. I wanted to point a finger behind me and say, "That's what it's like to live in Japan!" But I didn't. The part of Kurashiki where this place is is called the "Bikan" area, which means, "picturesque." It certainly does live up to its name! Walking along all the little side streets I kept stopping to take pictures. The storehouses are covered in plaster and a plaster-tile latticework is the main image for these traditional buildings. Both of these elements are fire resistant which was very important before the arrival of electricity. There are also some merchant abodes, which are great examples of traditional Japanese architecture and garden techniques. Basically everywhere you look there's something traditional, intricate, cultural, and the day happened to be brilliantly sunny with just enough chill to keep the sky crystal blue behind fluffy white clouds. So I went home feeling confident and designed a trip around the area that included fun and games, short presentations, and room for anything that might come up. I had to do something that spanned across varying levels of English. I made individual nametags for the participants. I even threw together a pre-task worksheet and some aditional conversation guides in case we ran in to some foreigners. On the day of the event, 14 students showed up. We did some basic warm up conversation and then wandered in to a pictureque courtyard for some fun activities before venturing in to the streets of the Bikan area. What happened next I took me completely by surprise. Instead of me pointing out something and having the students explain it using their new vocabulary, the students starting pointing things out to me and explaining them from the extensive research they'd done ahead of time. Just as I was about to point out the art museum, a student caught my hand and showed me the tiles on a roof of a home that the founder of the Ohara museum had had built for his wife. "It's called the Green Palace because of the tiles reflect greenish in the sun." I hadn't noticed that! Just as I was pointing out the willow trees that line the canal, a student started explaining to me how the canal was used to transport merchandise in and out to sea and how you could still find the old docking places by looking for very old stones that stuck out of the wall. Another student had prepared a two minute speech to explain how the local brewery signaled that the sake was ready for sale by hanging a ball of cedar branches outside of the door. Instead of relying on things the students already had studied, I dared to start asking my own questions. "Why does the bridge have a dragon design?" None of the websites had answered this question. Thirteen people pondered. One person stepped forward and told me that dragons are an auspicious symbol which was necessary to put on a structure that is susceptible to flooding or other disasters. "Why are there wooden lattices set up in front of the houses?" A student explained that it was so stray dogs didn't wee on the white buildings. When you have so many passionate people together, someone will know the answer! There was even a guy who's great grandfather shares a name with the local sweets and had some connection in the area a long time ago. At one point I saw a foreign couple walking toward us and I stopped them and asked if they'd enjoy a quick explanation of the area from some of my students. The woman seemed a bit suspicious of us, but her husband was happy not only to listen to a few of the brave students' presentations, but told them about his home in the Netherlands. One thing I overestimated was that Japanese people would already know and understand Japanese terms. For example the latticed windows called, "mushikomodo" were so named because they resemble the fine bamboo latticed boxes that were made to house crickets. I've seen Mulan and I've looked in to the tradition of keeping crickets in little bamboo boxes in order to hear them sing. I just assumed my students would make the connection automatically. But it actually required quite a lot of explaining before everyone understood the definition. The other one that surprised me was the "Tomoe" symbol. Tomoe is a girl's name, and it is also the water half of the yin-yang symbol. This symbol, three times in a circle, is a common motif on shrines, seals, tiles, and art. Because it is associated with water, it is used as a kind of ward against flooding or leakage. As a foreigner, when I go to a shrine and see an unusual symbol, my brain registers it, tries to decipher it, tries to remember what was learned in Art History class, and I'm always reading the pamphlets or guide books to back up my knowledge on the places I've been to. I was shocked when some of the people in the group didn't know the symbol. I was more shocked when they found it surprising that the symbol would be a bit different depending on the house. Here I'd always felt lagging behind in knowledge when it came to symbols of folklore. Now I realize that because I'm always analyzing the symbols around me with an outsider's eye, I may know more than I think. 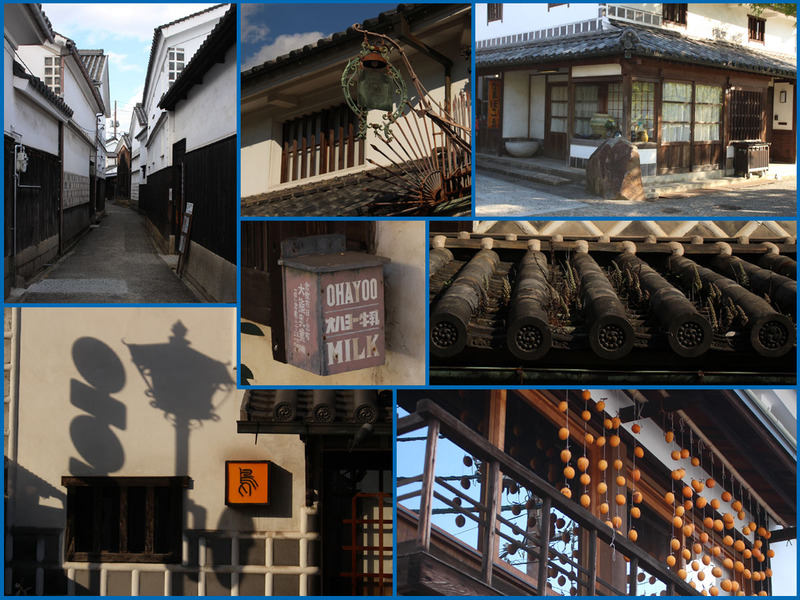 If you come to visit me in Okayama, let's go to Kurashiki's Bikan area! I could go every day and not be tired of it! !